Activity levels in the real estate sector remain constrained by on-going uncertainty following Egypt's 18-day revolution. 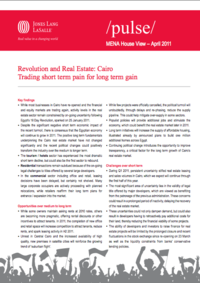 Trading short term pain for long term gain: While most businesses in Cairo have re-opened and the financial and equity markets are trading again, activity levels in the real estate sector remain constrained by on going uncertainty following Egypt’s 18 Day Revolution, sparked on 25 January 2011. Despite the significant negative short term economic impact of the recent turmoil, there is consensus that the Egyptian economy will continue to grow in 2011. The positive long term fundamentals underpinning the Cairo real estate market have not changed significantly and the recent political changes could positively transform the industry over the medium to longer term. The tourism / hotels sector has experienced the most dramatic short term decline, but could also be the first sector to rebound. Residential transactions remain subdued because of the on-going legal challenges to titles offered by several large developers. ? In the commercial sector including office and retail, leasing decisions have been delayed, but certainly not shelved. Many large corporate occupiers are actively proceeding with planned relocations, while retailers reaffirm their long term plans for entrance / expansion into the market. All whitepapers are available to you and free of charge. This whitepapers is provided by Jones Lang LaSalle.